Geez, Louise: Another Wishlist + Awesome Announcement! Another Wishlist + Awesome Announcement! You know what happens when you are really really really busy? You forget about your birthday. Thankfully, I didn't miss it or anything, but I actually forgot about it until a day or two ago. It's less than a week away. I have a presentation due that day, so you can probably assume I'm really pumped about it. I also have a bachelorette party to attend the weekend after, which sounds all well and good but it isn't exactly what I want to be doing the weekend of my birthday. Oh well, I'll have more I guess. 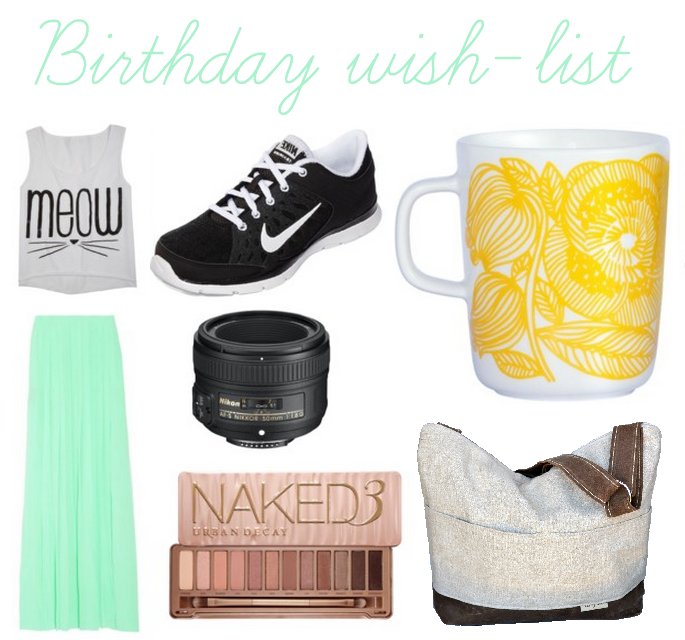 But while we're on the subject of my birthday, why not let me tell you all some of the things on my wishlist this year. I've been loving anything with cats on it recently so this tank top is perfect, and I'm really not a fan of pants so I've been stocking up on maxi skirts because they're probably the best piece of clothing ever invented. I love this mint green one. I haven't bought a new pair of tennis shoes in almost two years so I think it's time for some new ones. I've mentioned before how much women's athletic shoes annoy me with all of the neon and all of the pink so I am really loving these black and white Nike's. As you know, I got a really awesome camera for Christmas and now it's time for some accessories. A new lens is probably at the top of my list as a must, but this linen camera bag comes in a close second. I actually wouldn't mind both (hint hint). ------------------------------------------------------------------------------------ I'm also super excited to announce that I'll be co-hosting a really fun link up with Brooks, from The Handey Way. Who: Link up with myself or Brooks What: think about all the things that you'd never want to do before you die. Basically the opposite of a bucket list. When: Next Thursday, April 3rd How: Grab the button code above and paste it on the bottom of your post. Link up and visit other blogs and see everyone else's list! If you get that lens you're going to LOVE it. I have a canon with a comparable 50mm 1/8f and wish I could use it for everything. That coffee mug is so pretty, and the skirt, and the bag, and the shoes.. wait everything is so pretty! I didn't know you were an April baby too. I love that camera bag!!! Want. LOVE those tennis shoes!!!!!!!!!!!!!!!!!!!!!!!!!!!!!!!!!!!!! GIMME!!! You need that lens. This is not a test, nor a drill, you NEED it. 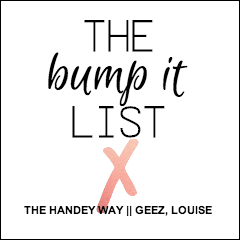 haha the bump it list- too cute! Hahah I did an anti-bucket list post a few weeks ago... Love the idea! you will love that lens. it is the only one i use any more. Such a cute camera bag and lens and I love love love the mint maxi skirt! Adorable! Well that idea is just genius and I love that your birthday is so soon!